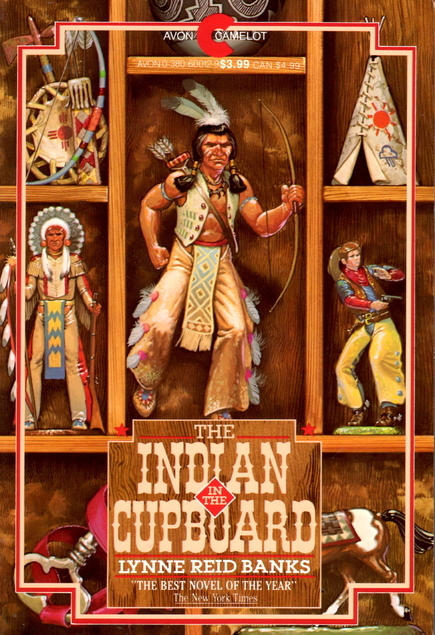 The Indian in the Cupboard by Lynne Reid Banks was first published in 1980 and probably just about everyone who is interested in reading it has already read it or seen the film, but I only picked it up because I noticed that it was written by Lynne Reid Banks. It’s over forty years since I read her L-Shaped Room trilogy and loved it – as did Jack and my mother, two people who would normally have very different tastes in books. Omri is one of three brothers and when his birthday comes around his brother Gillon gives him an old cupboard for his present, not that he had bought it, he just found it lying around in the alley where the bins were kept. Gillon’s pocket-money had been stopped as a punishment, so that was the best he could do for a present. Omri is quite disappointed by his presents, his best friend Patrick had only given him one of his old plastic figures – a Native American Indian. The cupboard has a lock on it and Omri’s mother thinks she might have a key which would fit it amongst a lot of old keys she has. Sure enough one does fit and when Omri decides that the best thing he can do with his Indian is store it in the cupboard – the magic begins. I know that the toys coming to life is a bit of a cliche but that’s probably because we’d all love it to happen. This was a great read and Lynne Reid Banks managed to create a really authentic family with great interaction by the brothers. Have any of you ever watched the film and if so – should I?